Twix Cookies a.k.a. 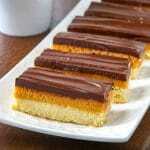 Millionaire's Shortbread! Easy to make & so decadent! These Twix cookies were inspired by the famous candy bar. Also known as Millionaire Shortbread, these indulgent bar cookies with a buttery shortbread base, caramel centre and rich chocolate top layer. 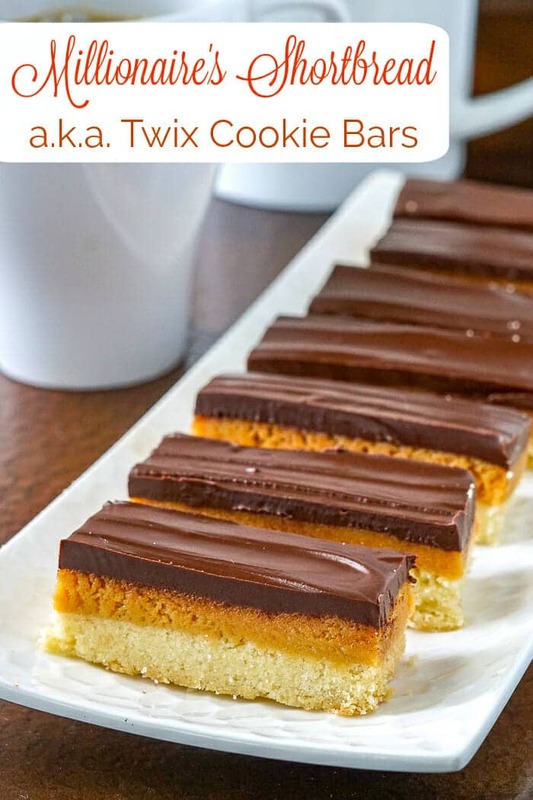 These Twix cookies were inspired by the famous candy bar; indulgent bar cookies with a buttery shortbread base, caramel centre and rich chocolate top layer. Another great recipe for holiday baking or at any time of the year and are a particular favourite of kids of all ages around here. Twix Cookies, cut into fingers. 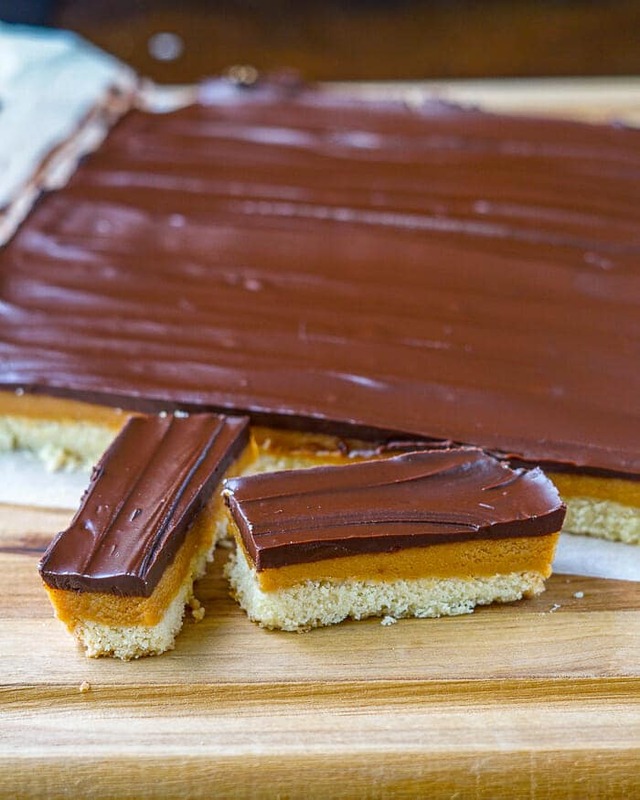 In Great Britain, these cookie bars are known as Millionaires shortbread. With all of that sweet indulgence on top, it’s no surprise it earned that name. No matter what you call them, they are pretty easy to prepare and hard to resist. Luckily they are also freezer friendly, which makes them ideal to mae ahead and serve when you need them. Caramel for txix cookies, as it starts to boil. Keep them in mind for the Christmas Baking season too. They will be the first cookies snatched off any Holiday treats platter! Like this Twix Cookie recipe? 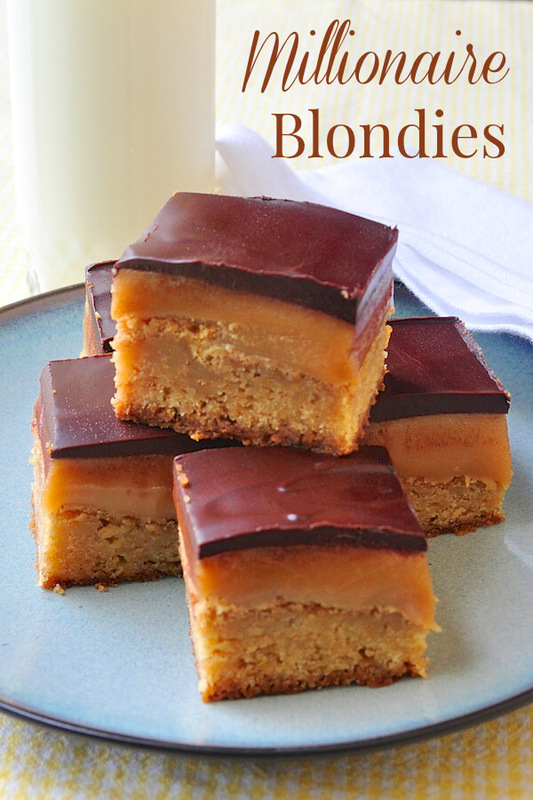 You might also like our Millionaire Blondies recipe! Pulse together in a food processor until crumbly or just rub together with your hands until crumbly. Press into the bottom of a well greased or parchment lined 9x9 baking pan. Bake at 350 degrees for 20-25 minutes until it begins to brown at the edges. Remove from oven and cool completely before adding the caramel layer. 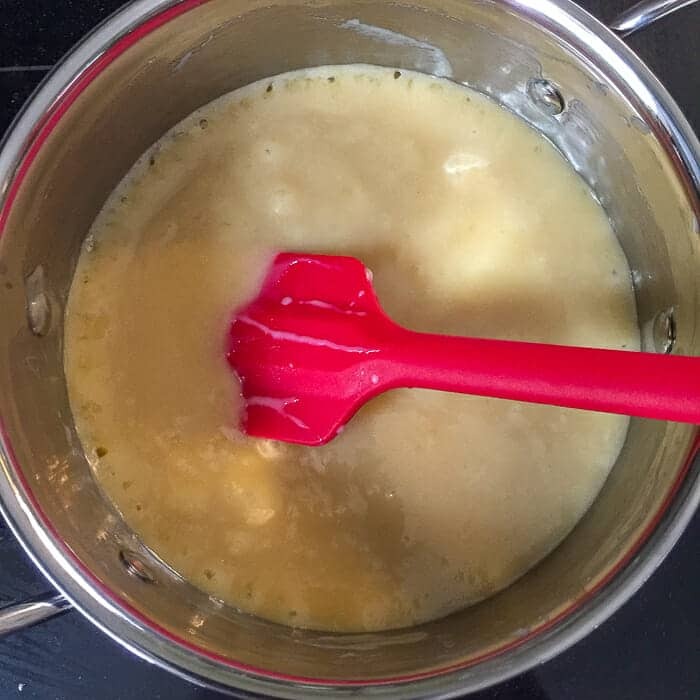 In a small saucepan combine the butter, sugar and vanilla extract. Bring back to a very slow boil over medium low heat and cook, stirring continuously for another 15-20 minutes until the mixture darkens slightly and thickens. Remove from heat and pour into the prepared shortbread base. Chill for 2 hours or more until thoroughly cooled before adding the chocolate topping. Melt together the chocolate chips and butter in a double boiler. Spread evenly over the cooled caramel and let stand until the chocolate sets before cutting into bars or squares. Can you substitute the dark corn syrup for maple syrup/pancake syrup? I really wouldn’t recommend that. In your recipes when you mention butter is it salted or unsalted butter? You can use either, but I’d stick to the salted for the caramel. We traditionally bake with salted butter in our neck of the woods but unsalted is fine too, especially in frostings. can Marg be used instead of butter? I wouldn’t. Butter is needed for caramel. I have frozen them, yes. I made these and they were lovely! Just right. I added a pinch of coarse salt to the caramel. 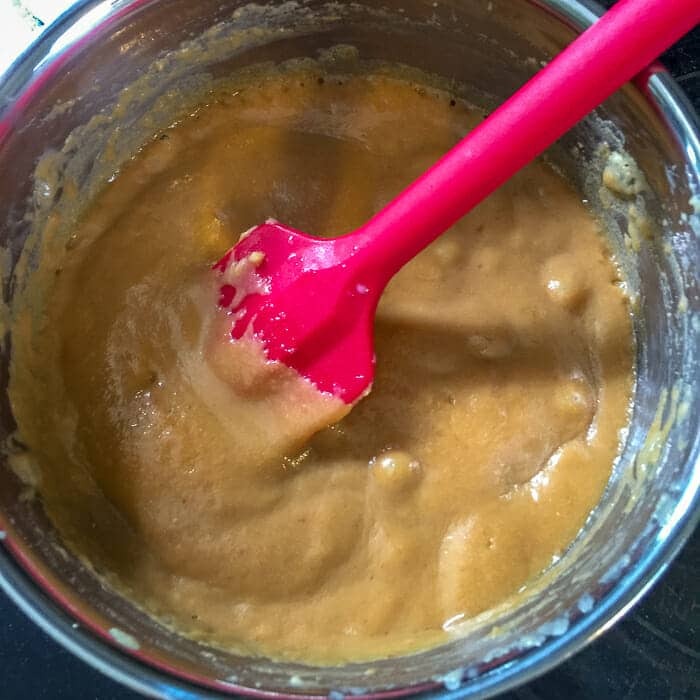 My caramel was weird and mealy looking, almost like applesauce texture. I was worried the sugar had crystallized but after chilling in the fridge it settled into caramel perfection. It turned out amazing for me…My husband loved it and he is hard to please!! thank you for such a delightful recipe.